Vaitheeswaran koil is a popular place of pilgrimage in South India. According to tradition the place is known as Pullirukkuvelur: Pul-bird-jatayu, Irukku â€“ Rig veda, Velmurugan, Oor-sun. All these four offered their work ship here. The place also goes by the names: Jatayupuri, Vedpuri, Angarakapuram and many more. People familiarly call it Vinaitheerthan koil and Thayyalnayaki koil. The Sthala Vriksham is Vembu (Margosa), The beautiful tank goes by the name Siddhamirtha Theertham. The Jadayu Kundam of Ramayana fame is in the southern praharam in this Temple. Ravana Who was abducting Sita to Lanka was obstructed by Jadayu. Ravana, in the fight, cut off the wings of jadayu and so Jadayu fell at this place and kept his breath till Rama came and apprised Rama of the abduction, and later died. Rama performed his last rites. This place is Angaraka Kshetram. There is a fine bronze image of Angaraka to which pooja is done daily. It is said that Murugan got his vel (Lance) here. People who are possessed by evil sprits come here and get cured by bathing in the tank for a stated period. Vaidyanathaswamy is the curer of all diseases and He is said to cure 4,480 diseases with Amritha Sanjeevi and Vilvathadi Mann. The Goddess Thayyalnayaki is said to accompany Him and Holy oil-vessel. 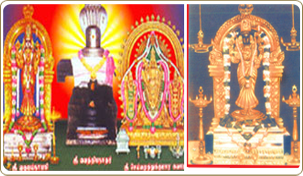 Nethrapidi Sandhanam and Thiruchandu Urundai are two of the prasadams which are believed to cure all ailments. Selva Muthukumaraswamy (Lord Murugan) attracts the attention of one and all who visit this place. Every month during the Karthigai day a grand abhishegam is performed to Sri Selva Muthukumaraswamy. Every Tuesday the idol of Angaraka is taken in procession on his Goat mount. Though not is such large numbers for a temple of this size and importance, one sees some Pallava Arts such as the Yali pillars. 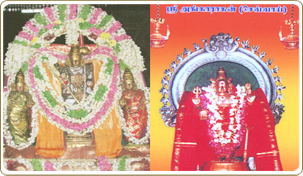 Thirugnanasambandar, Thiruvanukarasar and Arunagirinathar have sung in praise of the Lord. Almost every child in these parts is brought to Vaitheeswarankoil to have its locks of hair offered to Vaithianathaswamy. Devotees deposit salt and pepper also in front of the Sannadhi. 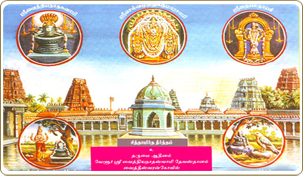 The temple at Vaitheeswarankoil promises to cure all the ills of the body, mind and spirit of every devotee. The margosa with thick foliage standing beside the eastern gopuram murmurs through its leaves the song of His praise as the celestial healer of all human diseases. The nectar utilized by the Siddhas for the ablutions of the deity mixed with the water of the temple-tank which came to be called Siddamirtha Theertham. Ankaraka was cured of his leprosy when he bathed in this tank. By reason of the anathema pronounced by Saint Sadananda, the tank is freed of snakes and frogs. It is so till to-day. The temple tree was Kadamba during the Kritayuga Bilva during the Tretayuga, Vakula during the Dwaparayuga and in the Kali Age it is neem. Medicinal pellets are compounded with the mud of Angasantana tank, the holy ashes from the Vibuti Kundam, bilva and neem leaves as well as sandal paste. These are taken with the water of the siddhamirtha-tank constitute a sure remedy.